In this world, perfection is a very rare thing. Good things are common, and even great things can occur now and again. But when perfection walks by, our jaws hit the ground and we stand in awe. Perfection isn’t merely remarkable for all that is right about it, but also for all that’s not wrong. In an imperfect world, everything has flaws. But when we see perfection, damned if these flaws can be spotted. 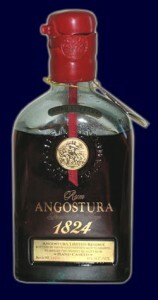 To the nose Angostura 1824 is cool and savory, but in the throat it’s warm and deep. The flavor is sweet, but not overly so. It lingers of over-ripe berries, and just a little spice. Not remotely harsh, this rum is both invigorating and comforting. It’s meant to be sipped and cherished, and shared only with the closest of friends. 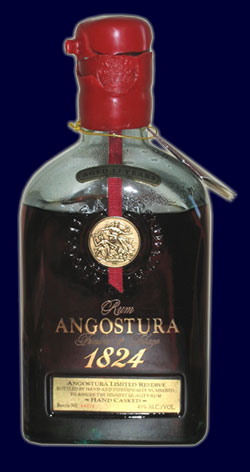 This entry was posted in Rum and tagged amber rum, angostura, bilgemunky's favorites by Bilgemunky. Bookmark the permalink. this is indeed a fine rum and i don’t really likes the rum! but this transcends the category and moves into the sphere of fine brandies. a fine tot an’ no mistakes me hearties!